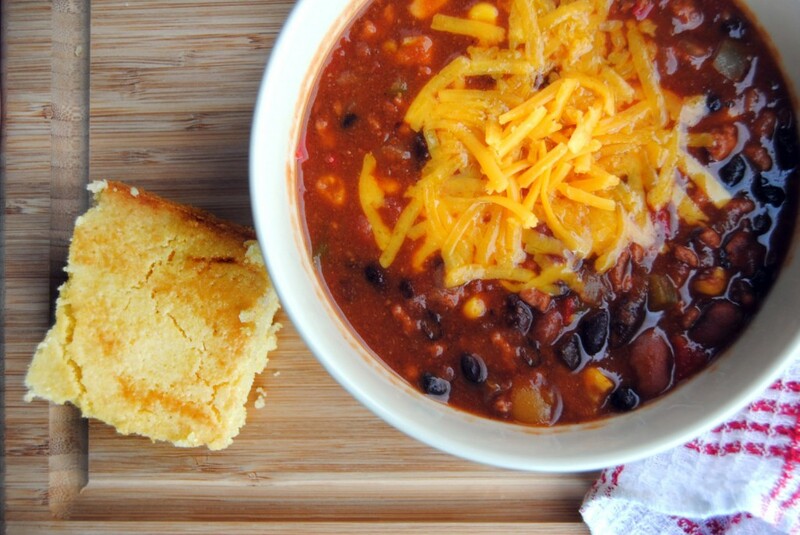 A hearty turkey chili with a side of sweet buttermilk cornbread. It may not be classy, but who cares? Let the face-stuffing begin. This week marks three years since I packed up my life and moved across the world for a boy. It has been an incredible adventure and I’ve treasured the many and varied experiences that go along with living abroad and being in a “multicultural” relationship. Not a day goes by that I don’t learn something new, whether it’s a new word, tradition or cultural faux pas. I’ve learned my share of the latter, that’s for sure. I’ve also picked up lots of habits, from living in Portugal but also from being part of a Brazilian family. Like the Portuguese, I drink espresso, eat dinner at 9:30PM, and hold my fork in my left hand. Like the Brazilians, I can’t go a week without eating rice and beans or I start to experience withdrawals, pão de queijo (Brazilian cheese bread) is now a food group for me, and whenever I stub my toe I let out a resounding “filho da p***”. There are certain things though, that as an American, I just can’t live without. Chili and cornbread are two of those things. Also, ketchup… but I digress. 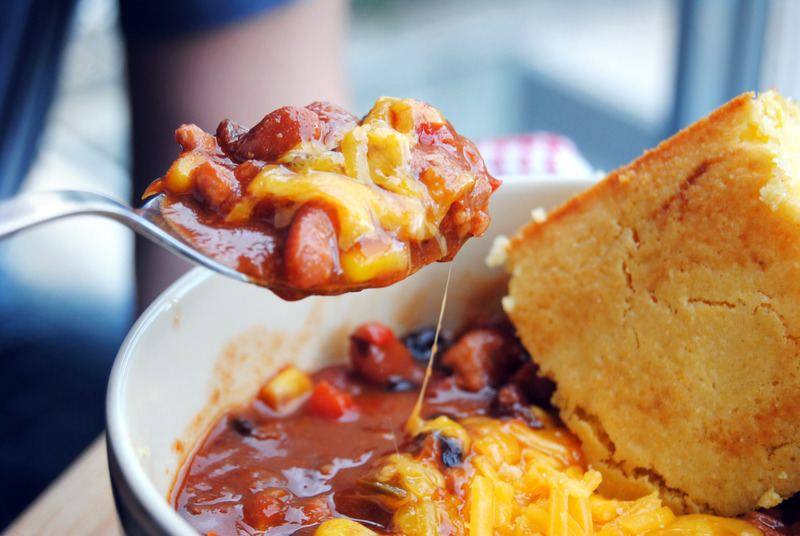 I grew up eating chili, whether homemade or from a hole-in-the-wall diner, or just canned Hormel chili, heated in the microwave with a bunch of Frito corn chips on top (foodies forgive me, for I have sinned). It’s a great winter comfort food and an equally great summer barbecue food. No Super Bowl would be complete without it. No Kalen would be complete without it. The first time I made chili for my honorary Brazilian family, I accidentally made it moderately spicy… or at least, moderately spicy by American standards. The trouble is that by Brazilian standards, our “moderately spicy” might as well be hellfire in a bowl. So, while I poured extra hot sauce into my bowl, the others sniffled, coughed and wiped sweat from their foreheads, all the while saying (through their tears) “Wow, que bom, this is just delicious!” Ah, the things I put them through. I’ve since perfected a nice, mild chili recipe which is extremely flavorful but won’t burn the tastebuds off of those who aren’t used to heat. Our chili routine is always the same. I make an unreasonable amount, we eat an unreasonable amount, and then we nap for about 4 hours. Yep, life is good. This is my all-time favorite chili recipe. It takes a long time to cook, but it is absolutely worth it. You can reduce the cooking time if you want, of course but the longer it cooks, the better it tastes! As written, it's barely spicy so feel free to add a few more peppers for some extra heat. The cornbread is also an awesome recipe. I usually make it as corn muffins, because the more crispy edges the better! This time, I made it in a square pan, mostly out of laziness. Either way, its delicious. Nice and crisp around the edges, fluffy and sweet inside. optional toppings: sour cream, cheddar cheese, chopped green onion, etc. Heat olive oil in a large pot over medium-high heat. Add onion and garlic and sauté until onion soft and translucent. Add turkey and cook until lightly browned. Add beer and cook until about half of the liquid has been absorbed - be sure to scrape any browned bits from the bottom of the pot. Add tomatoes, chopped bell peppers, jalapeño and spices. Reduce heat to low and simmer for at least one hour, stirring occasionally. You may need to add more liquid to the pot; I used water but you could also use broth. Add beans and cook for another hour. Add corn and cook for another 30 minutes. Adjust seasoning to taste and serve with desired toppings and freshly baked cornbread. When the chili is about an hour from ready, preheat the oven to 375ºF/175ºC. Grease an 8-inch square pan. Melt butter in a medium pot, remove from heat and let cool slightly. Stir in sugar. Add eggs and beat until well blended. Add buttermilk and stir to combine. Add cornmeal, flour, baking soda and salt and mix until the batter is smooth. Pour batter into the pan and bake for 30-40 minutes, until a toothpick comes out clean. Looks and sounds delicious! If that’s the cornbread you made when I was there, I can personally vouch for its deliciousness! It’s actually not – it’s an even better one! What a hit! Today is going to be my second time making this! I did make a couple of adjustments. I used ground beef and I replaced beer with beef broth (none on hand I bet its even better with beer!) and I only used red beans (all I had on hand also) and I added half the amount of corn (Personal preference) omg it was yummy! My boyfriend had 2 big helping and made sure he got to take some to work the next day! We had ours with avocado and sour cream and my own cornbread recipe. Finally found a easy and great chili recipe. And its so easy to adapt to your own liking.